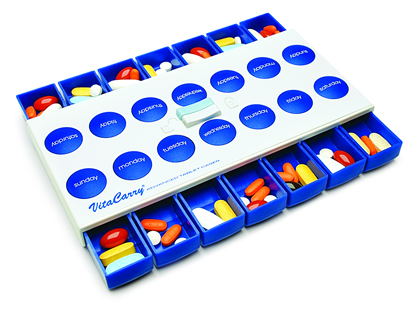 With 14 large compartments, this clever locking pillbox dispenser, can hold up to 2 weeks of medicine or vitamin tablets. If you need just a weekly vitamin organizer, use as a morning and evening 7 day pill box instead. VitaCarry created a pushbutton and safety lock technology that is easy to use and will remain closed in your purse, briefcase, or suitcase making this dispenser a must have over traditional clumsy flip lid pill boxes. This pillbox is perfect for a long business or pleasure trip when an ample supply of supplements or medications is required.